Today is the first day of skincare 101 on the blog. This whole series was inspired by the 2014 blogger challenge in which this weeks topic is skincare. So for the rest of the week the blog will be all about skincare. Since I have a huge obsession with skincare because I have problematic skin, I figured I'd share some of the things I've discovered throughout my journey to healthy skin. In recent months my skin has broken out like it never has before. It seemed like nothing I did was working. It wasn't till mid July when I started doing some intense research and discovered the acne face map. This goes back to ancient eastern medicine, where the Chinese believed that you could determine the cause of acne by where they appeared. Basically the idea is that there is a direct correlation between your breakouts and your internal organs, and when you think about it your skin is the largest organ in the human body. Now I can say that I have seen these ideas to be true. When I'm back at school I tend to breakout on my cheeks due to the polluted air. I also noticed that once I cutout fizzy drinks from my diet my forehead acne had subsided. I also breakout around my chin during that time of the month. Now I think its best to know what could be the possible underlying causes of your breakouts that way you can find the best way to fight it. Of course there is the inevitable breakout from that time of the month, but some lifestyle and diet changes could definitely help you get clear, healthy skin! Forehead acne is many times linked to lack of sleep and stress, it is also linked to your digestive. So eat less junk/processed foods and opt you fizzy drink for agua! Be sure to get your beauty sleep with 7-9 hours a night. Between the brow acne can be linked to the liver. This is caused by excess in alcohol and unhealthy foods. This means to cut back on the alcohol, greasy foods and if you can dairy. Cheek acne is linked to your respiratory, this could be caused by smoking, allergies or breathing in polluted air. Nose acne is linked to your heart. Check your blood pressure and vitamin B levels to ensure they are healthy. Avoid pungent food, eat less salt and meat, and get fresh air. Side of chin acne is linked to hormones. Now hormones are hard to control, but getting enough sleep and eating more greens can help control them. Center chin acne is linked to your stomach. This means increase your fiber intake and drink herbal tea to help soothe the stomach. Checkout these sites for more information on face mapping! Hope this was helpful, have a great day! 24 comments on "Skincare 101: Face Mapping"
This is awesome! I have some health problems & they correspond with the problem spots on my face, which is crazy! Thank for checking it out and glad this was helpful! I love face mapping! Whenever I get a breakout, I tend to realize it's from some of the health issues I've been having. Crazy how it works! I was shocked how well it worked for me. I have fallen in love with the concept. Your face map photo looks awesome! 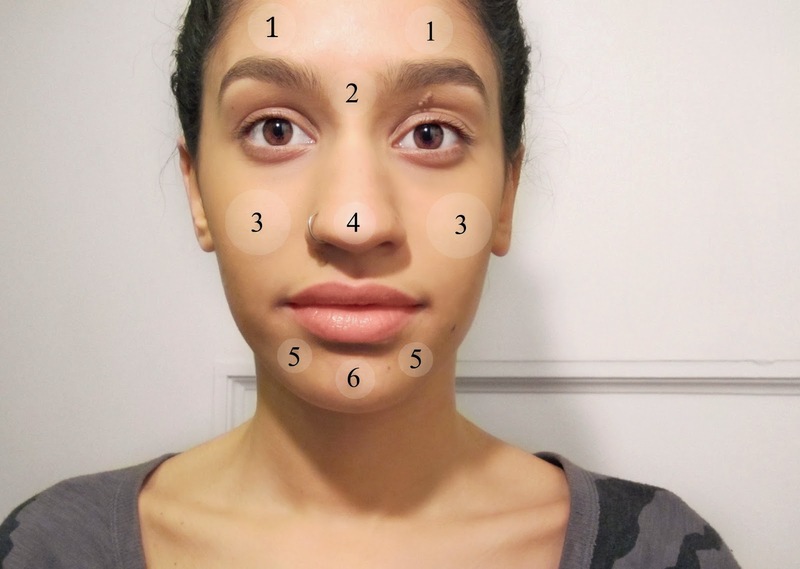 Very informative post, I always forget what certain spots on your face are caused by! This is insanely cool! I have respiratory issues and the only spots I get are on my cheeks. Thanks for the awesome post! Glad you enjoyed and found it helpful! truely amazing! never heard of this and I'm also a massive skincare addicted so more information to add to my routine. Great blog ! This is amazing! Super helpful, thanks for the post!